ਨਆਰਾ: "Fa'avae i le Atua Sāmoa"
"ਸਮੋਆ ਰੱਬ ਉੱਤੇ ਉਸਰਿਆ ਹੈ"
↑ New Zealand Ministry for Culture and Heritage (19 July 2010). 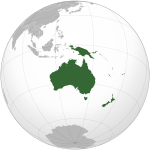 "Towards independence - NZ in Samoa". nzhistory.net.nz. Retrieved 29 April 2011. ↑ "CIA - The World Factbook". cia.gov. 2012. Retrieved 9 August 2012. ↑ 3.0 3.1 3.2 3.3 "Samoa". International Monetary Fund. Retrieved 20 April 2012. ↑ Staff/Agencies (31 December 2011). 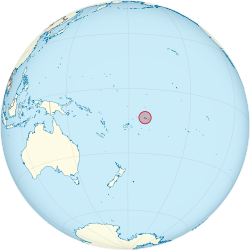 "Samoa skips Friday in time zone change". ABC Australia. Archived from the original on 16 January 2012. Retrieved 16 January 2012. ↑ Chang, Richard S. (8 September 2009). "In Samoa, Drivers Switch to Left Side of the Road". The New York Times. Retrieved 23 May 2010.